For API Gateway to trust X.509 certificates issued by a specific Certificate Authority (CA), you must import that CA's certificate into the API Gateway's trusted certificate store. For example, if API Gateway is to trust secure communications (SSL connections or XML Signature) from an external SAML Policy Decision Point (PDP), you must import the PDP certificate, or the issuing CA certificate into the API Gateway certificate store. In addition to importing CA certificates, you can import and create server certificates and private keys in the certificate store. These can be stored locally or on an external Hardware Security Module (HSM). You can also import and create public-private key pairs. For example, these can be used with the Secure Shell (SSH) File Transfer Protocol (SFTP) or with Pretty Good Privacy (PGP). You can search for a specific certificate or key by entering a search string in the text box at the top of each tab, which automatically filters the tree. Create/Import: Click to create or import a new certificate and private key. For details, see Configure an X.509 certificate. Edit: Select a certificate, and click to edit its existing settings. View: Select a certificate, and click to view more detailed information. Remove: Select a certificate, and click to remove the certificate from the certificate store. Keystore: Click this to export or import certificates to or from a Java keystore. For details, see Manage certificates in Java keystores. To create a certificate and private key, click Create/Import. 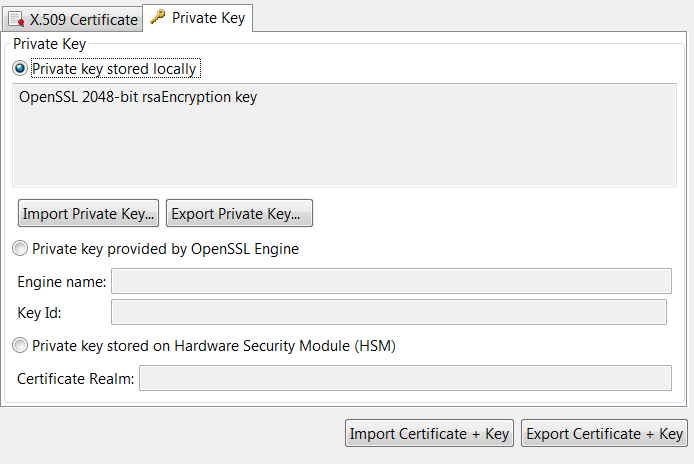 The Configure Certificate and Private Key dialog is displayed. 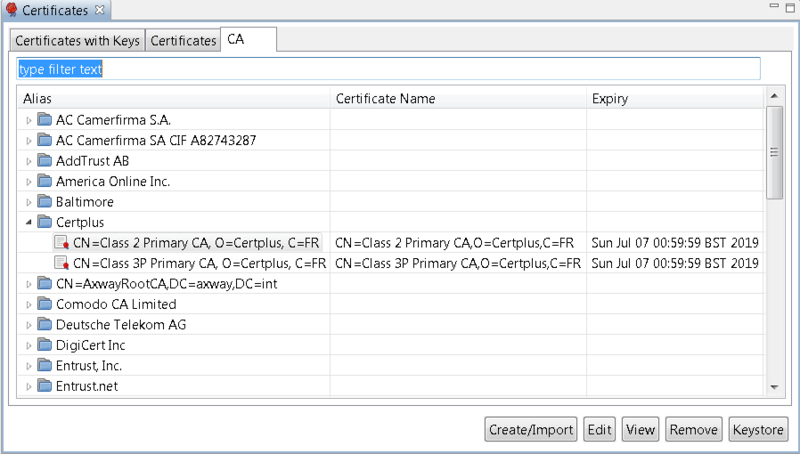 This section explains how to use the X.509 Certificate tab on this dialog. Click Edit to configure the Distinguished Name (DName) of the subject. This mandatory field enables you to specify a friendly name (or alias) for the certificate. Alternatively, you can click Use Subject to add the DName of the certificate in the text box instead of a certificate alias. Click Import to import the subject's public key (usually from a PEM or DER-encoded file). This read-only field displays the X.509 version of the certificate. This read-only field displays the distinguished name of the CA that issued the certificate. Select to explicitly specify an issuer certificate for this certificate (for example, to avoid a potential clash or expiry issue with another certificate using the same intermediary certificate). You can then click the browse button on the right to select an issuer certificate. This setting is not selected by default. Select a date to define the start of the validity period of the certificate. Select a date to define the end of the validity period of the certificate. You must click this button to sign the certificate. The certificate can be self-signed, or signed by the private key belonging to a trusted CA whose key pair is stored in the certificate store. Click to import a certificate (for example, from a .pem or .der file). Click to export the certificate (for example, to a .pem or .der file). Use the Private Keytab to configure details of the private key. By default, private keys are stored locally (for example, in the API Gateway certificate store). They can also be provided by an OpenSSL engine, or stored on a Hardware Security Module (HSM) if required. API Gateway supports PKCS#11-compatible HSM devices. For example, this includes Thales nShield Solo, SafeNet Luna SA, and so on. This read-only field displays details of the private key. Click to import the subject's private key (usually from a PEM or DER-encoded file). Click to export the subject's private key to a PEM or DER-encoded file. If the private key that corresponds to the public key in the certificate is provided by an OpenSSL engine, select Private key provided by OpenSSL Engine. Enter the name of the OpenSSL engine to use to interface to an HSM. All vendor implementations of the OpenSSL Engine API are identified by a unique name. See your vendor's OpenSSL engine implementation or HSM documentation to find out the name of the engine. Enter the key ID used to uniquely identify a specific private key from all others stored on an HSM. When you complete this dialog, the private key is associated with the certificate that you are currently editing. Private keys are identified by their key ID by default. If the private key that corresponds to the public key stored in the certificate resides on an external HSM, select Private key stored on Hardware Security Module (HSM), and enter the name of the Certificate Realm. Note To use the API Gateway's PKCS#11 engine to access objects in an external HSM, the corresponding HSM provider and certificate realms must also be configured. For more details, see Configure HSMs and certificate realms. Certificate realms are abstractions of private keys and public key certificates, which mean that policy developers do not need to enter HSM-specific configuration such as slots and key labels. Instead, if a private key exists on an HSM, the developer can configure the certificate to show that its private key uses a specific certificate realm, which is simply an alias for a private key (for example, JMS Keys). For example, on the host machine, an administrator could configure the JMS Keys certificate realm, and create a keystorefor the realm, which requires specific knowledge about the HSM (for example, PIN, slot, and private key label). The certificate realm is the alias name, while the keystore is the actual private keystore for the realm. For example, if a policy developer is using JMS, and wants to indicate that private keys exist on an HSM, they could indicate that the certificate is using the JMS Keys certificate realm. On each instance using the configuration, it is the responsibility of the administrator to create the JMS Keys certificate realm. 1 Change group or instance When registering HSMs or configuring certificate realms, you must choose the local group and instance to configure. 2 List registered HSM providers Display the HSMs that are currently registered. 3 Register an HSM provider Before creating certificate realms, you must first register the HSM. This option guides you through the steps. The HSM must be installed, configured, and active, and you must know the full path to the HSM device driver (PKCS#11). You give the HSM an alias (for example, LunaSA), which you use later when registering certificate realms. 4 List Certificate Realms List configured certificate realms and associated keystores. 5 Create a Certificate Realm Create a keystore and assign it to a certificate realm. Open a command prompt in the API Gateway bin directory (for example, INSTALL_DIR/apigateway/posix/bin). Select option 3) Register an HSM provider. If prompted, select the appropriate API Gateway group or instance. You are prompted for a provider alias name. The alias is local only. For example, if registering a LunaSA HSM, you might enter the LunaSA alias. Select option 5) Create a Certificate Realm. You are prompted to enter a certificate realm name. This certificate realm name is used in when configuring the private key of the corresponding X.509 certificate. The realm name is case sensitive (for example, JMS Keys). The registered HSMs are listed. For example, select option 1) HSM. The command connects to the selected HSM, and a list of available slots is displayed. Select the slot containing the private key to use for the certificate realm (for example, select slot 1). You are prompted to input the PIN passphrase for the slot. The passphrase will not echo any output. Note Each API Gateway instance must have its certificate realm configured. When finished creating certificate realms, you must restart the API Gateway instance for the changes to take effect. When API Gateway is configured to use certificate realms, these realms are initialized on startup, and a connection to the corresponding HSM is established. This requires the PIN passphrase for the specific HSM slots. At startup, you can manually enter the required HSM slot PIN passphrase, or you can automate this instead. API Gateway does not reprompt if the PIN passphrase is incorrect. It logs the error and continues, while any services that use the certificate realm cannot use the HSM. You can configure API Gateway to start and initialize the HSM by invoking a command script on the operating system to obtain the HSM slot PIN passphrase. This enables API Gateway for automatic startup without manually entering the PIN passphrase. To configure public-private key pairs in the certificate store, select Environment Configuration > Certificates and Keys > Key Pairs. The Key Pairs window enables you to add, edit, or delete OpenSSH public-private key pairs, which are required for the Secure Shell (SSH) File Transfer Protocol (SFTP). Enter a unique name for the key pair. Enter the algorithm used to generate the key pair. Defaults to RSA. Click to select the public key or private key files to use. The Fingerprint field is auto-populated when you load a public key. Note The keys must be OpenSSH keys. RSA keys are supported, but DSA keys are not supported. The keys must not be passphrase protected. To edit a public-private key pair, select a key pair alias in the table, and click Edit on the right. For example, you can load a different public key and private key. Alternatively, double-click a key pair alias in the table to edit it. You can delete a selected key pair from the certificate store by clicking Remove on the right. Alternatively, click Remove All. To configure Pretty Good Privacy (PGP) key pairs in the certificate store, select Environment Configuration > Certificates and Keys > PGP Key Pairs. The PGP Key Pairs window enables you to add, edit, or delete PGP public-private key pairs. Enter a unique name for the PGP key pair. Click Load to select the public key and private key files to use. Note The PGP keys added must not be passphrase protected. To edit a PGP key pair, select a key pair alias in the table, and click Edit on the right. For example, you can load a different public key and private key. Alternatively, double-click a key pair alias in the table to edit it. You can delete a selected PGP key pair from the certificate store by clicking Remove on the right. Alternatively, click Remove All. This section describes global import and export options available when managing certificates and keys. Use this option to import a certificate and a key (for example, from a .p12 file). 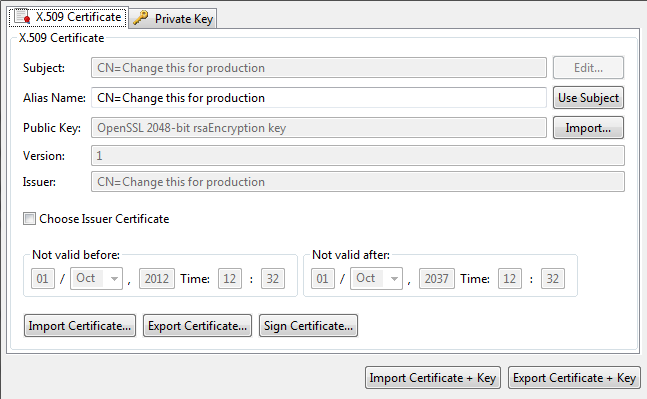 Use this option to export a certificate and a key (for example, to a .p12 file). Click OK when you have finished configuring the certificate and private key. You can also export a certificate to a Java keystore. You can do this by clicking Keystore on the main Certificates window. Click the browse button at beside the Keystore field at the top right to open an existing keystore, or click New Keystore to create a new keystore. Choose the name and location of the keystore file, and enter a passphrase for this keystore when prompted. Click Export to Keystore, and select a certificate to export. Similarly, you can import certificates and keys from a Java keystore into the certificate store. To do this, click Keystore on the main Certificates window. On the Keystore window, browse to the location of the keystore by clicking the browse button beside the Keystore field. The certificates/keys in the keystore are listed in the table. To import any of these keys to the certificate store, select the box next to the certificate or key to import, and click Import to Trusted certificate store. If the key is protected by a password, you are prompted for this password. You can also use the Keystore window to view and remove existing entries in the keystore. You can also add keys to the keystore and to create a new keystore. Use the appropriate button to perform any of these tasks. For more details on supported security features, see the API Management Security Guide.